Photo: Lynn Ketchum, © Oregon State University. Using a soil probe to take a sample. Figure 1. Collect a separate soil sample from each of the three areas (A, B, and C). Photo: Lynn Ketchum, © Oregon State University. Figure 2. Take 15 to 20 subsamples within one sampling area. Photo: Melissa Fery, © Oregon State University Figure 3. Soil sampling tools, from left: trowel, hori hori knife, probe, hammer probe (in two pieces), and a long-handled shovel. Figure 4. 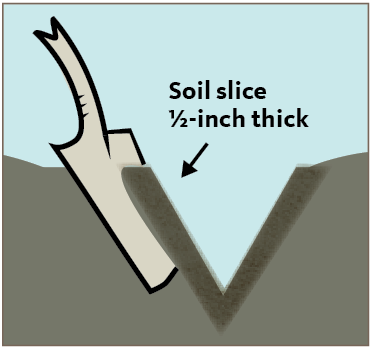 Slice sampling method using a shovel or trowel. Photo: Melissa Fery, © Oregon State University. Figure 5. Measuring sampling depth. Photo: Lynn Ketchum, © Oregon State University. Figure 6. Use a clean hand tool to mix the subsamples. Photo: Lynn Ketchum, © Oregon State University. Figure 7. Take a photo of your sample bags before you mail them, for future reference. Do not use a paper bag unless the lab provides one lined with plastic. Without a soil analysis, it’s nearly impossible to tell what your soil needs to help your crop grow. A laboratory soil analysis, or a soil test, provides information on the capacity of your soil to supply adequate nutrients. This helps you select the correct mix of fertilizer and liming materials, which can help you to develop and maintain your soil and increase crop production. The following recommendations are based on fertilizer experiments, soil surveys, and results obtained from on-farm trials. Why should I collect a soil sample? When should I collect my soil sample? For annual crops, such as vegetables, test soils when you first cultivate a field or change crops or rotations. If you plant successive crops in a single season, you don’t need to test before each planting. 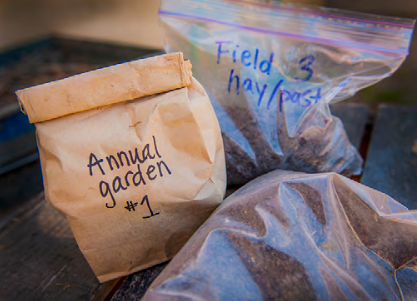 For perennial crops, such as orchards, tree plantations, alfalfa, grass seed, and permanent pasture, the most important time to test the soil is before planting so necessary nutrients can be incorporated into the soil. If you plan to compare soil test results with the results of a leaf analysis, take samples in August. For more information about leaf analysis, refer to Leaf Analysis of Nutrient Disorders in Tree Fruit and Small Fruits (FS 118), https://catalog.extension.oregonstate.edu/fs118. In high rainfall areas of western Oregon, soils are likely to be acidic and require periodic liming. Testing these soils in the late summer or fall allows time for these amendments to react with the soil before the following growing season. How often should I collect a soil sample? Soils should be analyzed often enough to recognize potential nutrient management issues before they adversely impact plant growth. In general, test every 2 to 3 years for annual crops, pastures, and legumes, and test every 3 to 5 years for Christmas trees, fruit and nut trees, berries, and grapes. Take samples at the same time of year so results are comparable from year to year. Where should I collect a soil sample? The area from which to collect a soil sample may depend on the soil type, topography, crops grown, management history, or all of the above. 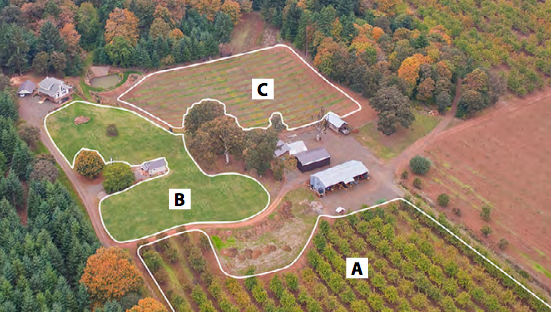 For example, the farm in Figure 1 has three separate sampling areas: A (orchard), B (pasture), and C (vegetable row crops). In this example, a separate soil sample should be collected from each of the three areas. The same concept applies to smaller acreages; for example, a lawn and a vegetable garden should each be sampled separately. How do I collect my soil sample? If you are using raised beds, such as for vegetable crops, take your samples in the beds instead of the areas between the beds where there are minimal roots. Avoid sampling in small areas where you know that conditions are different from the rest of the field (for example, former manure piles, fertilizer bands, or fence lines). You often can spot these places by looking for plants growing especially well or particularly poorly. Each sample should consist of subsamples taken from 15 to 20 locations within the sampling area (Figure 2). Use a soil probe (Figure 3) for ease and consistency of sampling. If a soil probe is not readily available, a shovel will work. Use clean sampling tools, and avoid contaminating the sample during mixing or packaging. A small amount of fertilizer residue on tools or hands, for instance, can cause serious contamination of the soil sample. Do not include mulch or vegetation in the sample. Do not use galvanized metal, brass, or bronze tools to collect samples that will be tested for micronutrients, such as zinc. Sample the part of the soil where the plant roots will grow. For most annual and perennial crops, sample from the surface down to about 6 inches (Figure 5) or to the depth of tillage. 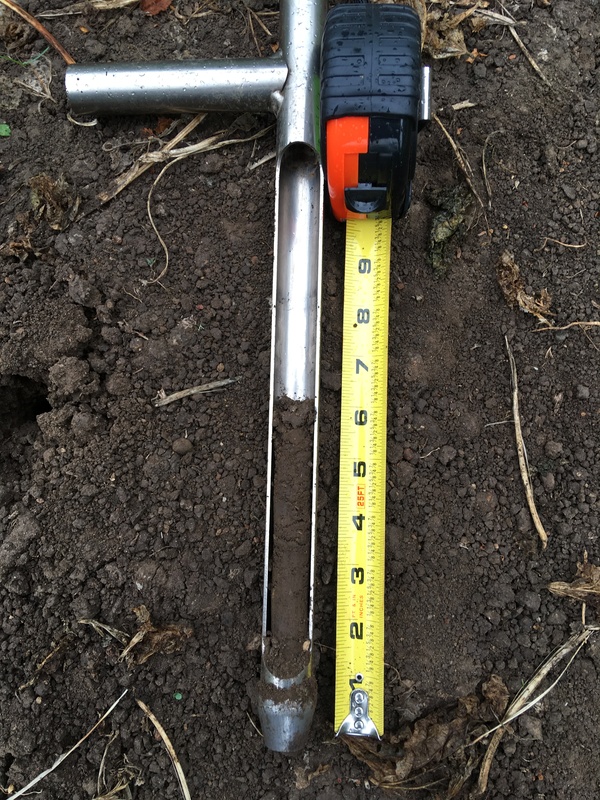 For perennial crops such as pastures and orchards or other soils that have limited or no tillage, refer to Evaluating Soil Nutrients and pH by Depth (EM 9014), https://catalog.extension.oregonstate.edu/em9014, for more information about collecting your soil sample. Soils with limited or no tillage can experience significant pH changes in the top 2 inches resulting from the addition of nitrogen fertilizers and lime. However, those changes may be obscured when samples are collected to a depth greater than 2 inches. Collect samples at the same depth. For example, if you take initial samples at a 6-inch depth, keep that same depth for all future samples to get a more accurate comparison. 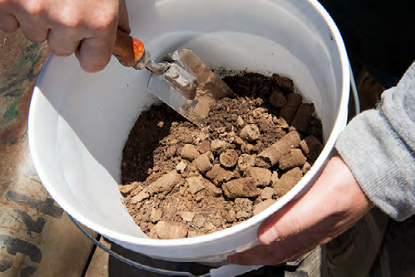 Place all of the soil subsamples from a single sampling area in a clean container and mix thoroughly (Figure 6). Do not worry about breaking the sample up into tiny particles. Labs have soil grinders to further mix the sample. Refer to Analytical Laboratories Serving Oregon (EM 8677) to find a lab that performs soil analysis. You can search for labs that participate in the North American Proficiency Testing (NAPT) program at www.naptprogram.org (EM 8677 includes NAPT-participating and also nonparticipating labs). Look for a lab that offers a soil test report that you understand. Labs may charge a fee for providing recommendations based on soil test results. Call or check the website of one or more labs to find out the cost of the soil analysis that you need. After choosing a lab, request any necessary paperwork (such as an information sheet), and find out how you should prepare and submit the sample. Prepare and submit the sample according to the lab’s instructions. Plastic zipper bags work best; do not use a paper bag unless the lab provides one lined with plastic. Most laboratories ask you to label the sample bag with identifying information and to fill out and include an information sheet with the sample. If mailing, don’t forget to include payment in a separate, sealed plastic bag. If you are requesting nitrogen tests, keep the sample cool and send it immediately to the lab. However, avoid shipping in the middle of the week if possible, as the sample may arrive over the weekend and may not be processed until the following week. For samples that will not be tested for nitrogen, spread the sample out on newspaper to air-dry prior to packaging for shipment. You may be able to obtain results sooner if you request to receive results via email. Ask the lab to provide both a printed report and an electronic spreadsheet format for more flexible recordkeeping. Number each sample, record sample depth, and keep a record of the fields and areas you sampled. Take a photo of the labeled sample bags before mailing them, for future reference (Figure 7). What analysis should I request? In high rainfall areas of western Oregon, the standard soil analysis includes phosphorus (P), potassium (K), calcium (Ca), magnesium (Mg), soil pH, and SMP buffer pH. Soil pH is a measure of soil acidity, whereas the SMP buffer pH test is used to estimate the amount of lime required to raise the pH of the top 6 inches of soil. 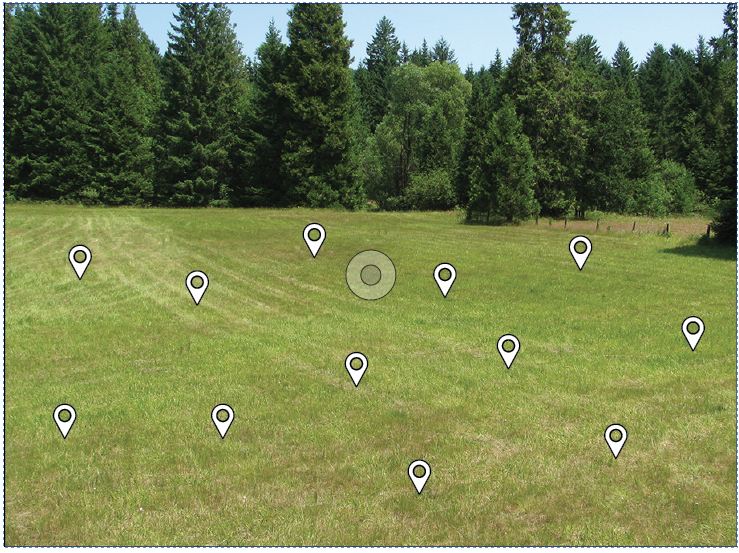 Nitrate nitrogen (NO3-N) is sometimes reported in standard soil tests, but is not useful to determine soil fertilizer applications in western Oregon, as nitrate is readily leached from the soil profile. To determine a nitrogen application rate for your crop, consult the specific fertilizer guide (see “Interpreting your soil analysis”). In arid regions, such as east of the Cascades, test for phosphorus (P), potassium (K), calcium (Ca), magnesium (Mg), soil pH, soluble salts (measured by electrical conductivity [EC]), sodium (Na), nitrate nitrogen (NO3-N), and sulfate (SO4). Some of these tests may not be part of a standard analysis, so be sure to check with the lab. Certain crops might have higher requirements for specific nutrients. Consult OSU Extension publications (see “Resources”) to determine whether you should test for additional nutrients. For example, boron (B) should be included in the analysis for tree fruits, nuts, berries, alfalfa, brassicas, and root crops. Once you have researched and selected a laboratory, plan to use the same lab for future tests to keep sample analysis consistent and detect changes in soil nutrients. Also, plan to take your soil sample at the same time of year, same depth, and same approximate field location. OSU Extension Fertilizer and/or Nutrient Management guides. To search for your crop-specific guide, go to the OSU Extension Catalog at http://extension.oregonstate.edu/catalog/ and search by keywords (nutrient management guide or fertilizer guide, and crop). You can also consult your local OSU Extension Service agent.